High Performance so that our pursuit and contribution may be accomplished with energy and simplicity. With each passing year, this timeless invitation and theme have felt more and more urgent. The tradition of holding this learning event during the Martin Luther King federal holiday weekend seems equally poignant and destined. 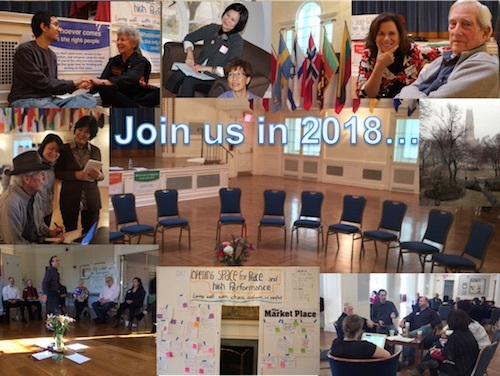 For decades, International House has been the gathering place for people near and far to learn and/or deepen their skills and practice around facilitating Open Space Technology. Individuals and communities around the world have benefited from the shared learning and work that we have done together in this special place in New York City. If the walls of International House could talk, one could only guess at the stories, the individual and collective awakening, the deep lifelong connections and the higher purpose actions that were ignited there. The experiment of Opening Space Technology (OST) began more than 30 years ago, and has subsequently been run hundreds of thousands of times. No less than 140 countries and millions of people have been involved with groups ranging from 5 to 4000 people. OST is an approach that invites purpose-driven leadership, including a way for hosting meetings, conflict minded peace building, conferences, corporate-style retreats, symposiums, and community summit events, focused on a specific and important purpose or task — but beginning without any formal agenda, beyond the overall purpose or theme. Open Space has shown us that hugely complex and conflicted issues can be dealt with productively in an environment of respect, hope, trust - and even a degree of intimacy and affection amongst prior sworn enemies. Some people have viewed the results as counterintuitive, unbelievable, even magic. The results continue, however, the "magic" is not OST. Rather it is the force that underlies it: the power of self-organization. By understanding, trusting and utilizing the primal force of self-organization we will collaboratively engage in the natural dance of order and chaos that leads to peace and high performance. Such is our timeless invitation for the gathering in January 2018 at International House. Whether you are new to Open Space or a long-time practitioner, these three days will certainly fuel your hearts, minds and souls for the important work and opportunities that await us all. The Program will unfold over 3 days, between 9 a.m. and 5 p.m. each day. We encourage you to participate in all three days though it is not a requirement. Day 1 will focus on the fundamentals of OST facilitation. It will be an opportunity to experience the Open Space process and learn the basics including core principles, the planning process, when to use Open Space, action approaches, and role and behavior of the facilitator. For experienced practitioners, it will be an opportunity to re-immerse yourself in the rituals and life-long practice of this work. Days 2 & 3: The design for each of the following two days is identical. In the morning, Harrison Owen, the originator of OST, will offer morning reflections that include “Creating the Conditions for Peace and High Performance” and on the final day “Opening Space in our Lives, our Organizations and our Planet”. Following this, all participants will have the opportunity to fully engage in dialogue and action oriented initiatives around the theme. We will all be teachers. We will all be learners. We will all increase our mastery. At the conclusion you will have a compendium of materials (online) including the proceedings of the sessions to remind you of your experience as well as some new connections to support you in your new ventures. If you are specifically interested in facilitating OST, the first day of the program is essential, as well as reading Harrison Owen’s Open Space Technology: A User’s Guide and viewing a video of a telephone company, OST at US West, (16 minutes): https://vimeo.com/25251316. Other recommendations are Harrison Owen’s TedX talk: http://bit.ly/I2v6mm and his books The Practice of Peace and Wave Rider: Leadership for High Performance in a Self-Organizing World. Space is limited. Fees include continental breakfast, lunches, coffee breaks and materials. If you are interested in guest room accommodations at International House, also contact Karen. Harrison Owen: Harrison is President of H.H.Owen and Co. His academic background and training centered on the nature and function of myth, ritual and culture. In the middle '60s, he left academe to work with a variety of organizations including small West African villages, urban (American and African) community organizations, Peace Corps, Regional Medical Programs, National Institutes of Health, and Veterans Administration. Along the way he discovered that his study of myth, ritual and culture had direct application to these social systems. In 1979 he created H.H.Owen and Company in order to explore the culture of organizations in transformation as a theorist and practicing consultant. Harrison convened the First International Symposium on Organization Transformation, and is the originator of Open Space Technology. He is the author of Spirit: Transformation and Development in Organizations, Leadership Is, Riding the Tiger, Open Space Technology: A User’s Guide, The Millennium Organization, Tales From Open Space, Expanding Our Now: The Story of Open Space Technology, The Spirit of Leadership: Liberating the Leader in Each of Us, The Power of Spirit: How Organizations Transform, The Practice of Peace, and Wave Rider: Leadership for High Performance in a Self-Organizing World. Karen J. Davis: Karen, a consultant with organizations globally, is committed to enhancing the health, effectiveness, and joy of human systems. She is dedicated to co-creating global communities through working and learning with colleagues throughout the world. For a decade Karen was graduate faculty in Santiago de Chile. She serves on the boards of Open Space Institute of US, the International Organization Development Association and previously the Organization Development Network, as well as on boards of community and cultural organizations. Karen is a co-author in The Sustainable Enterprise Fieldbook. She has been involved with Open Space since before its naming. When not traveling or working around the world, she lives in New York City, returning regularly to her native Arizona. Summers, she is on her farm in rural Quebec, Canada. Karen describes herself as a gardener and a world citizen. Open Space Institute US: OSI-US holds space for Open Space and serves by: providing access to resources on Open Space; connecting individuals and groups to inform, inspire, mentor, and sustain each other in opening and holding space; and being an inclusive learning community. We believe that inspired behavior can be an everyday experience and that humanity is only limited by its perceptions of the possible. OSI was created to grow that sense of possibility and make it a reality by focusing on: learning, research and practice.